The POD was set up on Saturday, 25 July. Assembly photos and report are on the “Road to Oracle Observatory” blog. Then the outdoor carpet was installed on Monday, 17 August. That report is also on the blog. 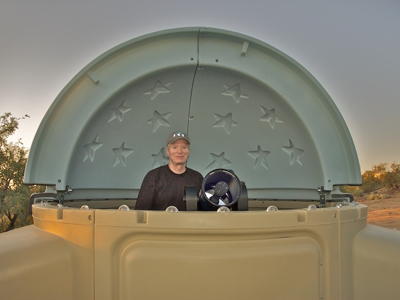 Finally, I prepared the observatory for “First Light”; see the blog for details. 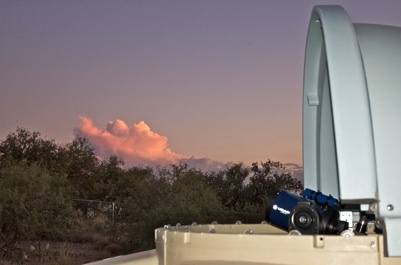 At sunset, the temperature inside the observatory (with the dome open) was 85°F. During the day, with the dome closed, the temperature had reached 122°F. When I powered on the telescope, it was able to get its location from GPS and go through its normal alignment steps. There was no interference from being inside the POD. First Light (except for the two alignment stars) was at 2000 MST using M4, a nice globular star cluster in the constellation of Scorpius. Over the next 80 minutes I observed several Deep Sky Objects in different parts of the sky, as well as the planets Jupiter and Neptune. Three moons of Jupiter were easily seen and the shadow of Io was plainly visible near the Great Red Spot, which was also visible. 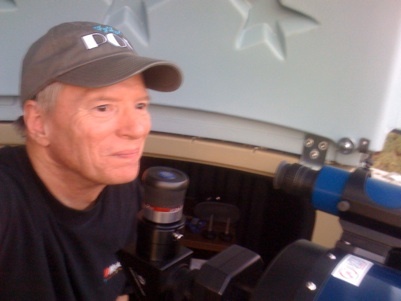 Neptune appeared as a small blue disk with a 15mm eyepiece (133X). It had been a long time since I had looked at Neptune. 1.I need to move the tripod more to the center of the POD. 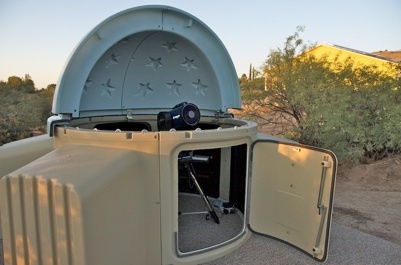 I had originally positioned it about a foot south of center to provide viewing access the zenith. However, the location prevented viewing in some parts of the northern sky near the zenith. It was also a tight fit to stand between the eyepiece and south wall of the POD when viewing objects to the north. I may have to consider a PZT (POD Zenith Table) in the future. 2.The tripod legs take up room and provide an “obstacle course” when moving around inside the POD. I am considering a pier for the telescope as a future enhancement. I still have more items to move into the POD and a couple of things to purchase. I really need to get a red “rope” light (with a rheostat) to place around the POD circumference at the floor. It is really dark inside the POD! Of course, that’s a good thing!!!! 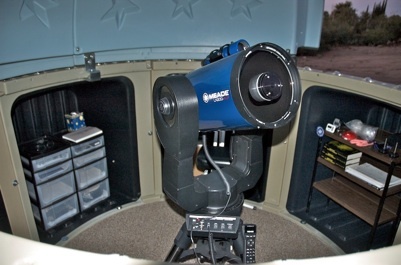 It was really a nice experience having my own observatory and I look forward to spending many long nights inside it. Unfortunately, we are still unpacking and organizing things inside our new home so I don’t know how soon or how frequently I’ll be able to observe. But I will be back!